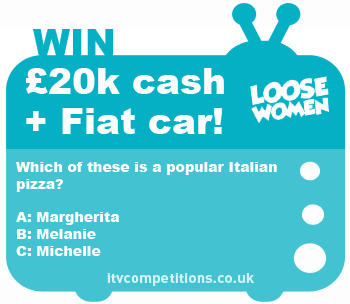 Loose Women competition – win a Fiat 500 car + £20k cash! The closing date for online entries is 15th February 2013 at 7.30am. Which of these is a popular Italian pizza? 6 entries permitted per phone number to the Loose Women competition. Enter online via the itv.com competitions page for free (phone call and texts cost +£1.50).